Again, another fascinating photo of Anglican bishops gathering in Uganda this week. Official photo includes both the Archbishop of Canterbury and the Archbishop of the Anglican Church in North America. A rather startling photo - pretty amazing to see +Bob Duncan sitting in the front row...! Surely that has caused some gnashing of teeth in certain quarters. Hmmmm. nah - he's just in front 'cause he's short! Again, it's Zelig. The key fact is what conversation, or meetings, or discussion did they have? We're not talking Pyongyang here. You know these folks and you get reports. So why rely on "fascinating" photographs when what really matters is what they said to each other. And what REALLY matters is what the Archbishop said to Duncan. Did he speak to Duncan substantively or was he just polite? 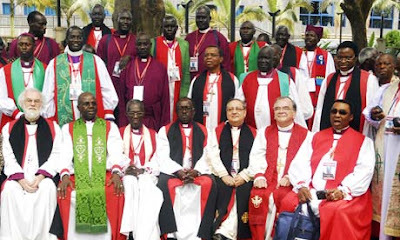 I'd like to know whether or not they discussed Uganda's Anti-Homosexuality Act, a.k.a., Hang the Gays Bill, and whether or not these are the Ugandan Anglican Bishops who have remained within the Anglican Communion rather than breaking away to join the Anglican Realignment over gay and women clergy, gay marriage, and gay rights.